Something about orange food must put the devil in me. Remember, if you’re getting to be old as the hills, like I am, when Orange Julius burst on the scene and its slogan was “a devilishly good drink”? Well, that’s what I always think about adding something orange to a perfectly good recipe. And that orange something in this case was some cooked sweet potato. The result was a happy accident I hadn’t planned. 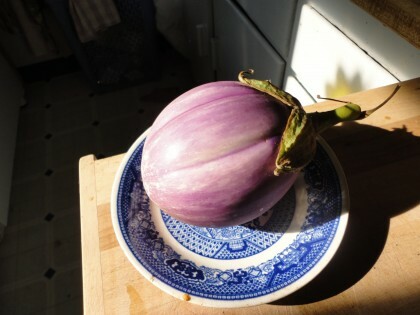 It started out with the fact that I had purchased eggplants like these at our Farmer’s Market, assuming two small ones might be equivalent to a medium or almost large one. But on roasting them and removing the most of the thick seeds I realized I’d have only almost half the amount of eggplant flesh required to make Susan’s Baba Ganoush recipe. So I halved the lemon juice and reduced the tahini, and added more spices and herbs. But something was missing, and it occurred to me all of a sudden that that something ought to be a dollop of cooked sweet potato. This sudden inspiration to add sweet potato is very easy to follow at my house, since Romeo and I both love them, and I almost always have cold cooked sweet potatoes in the fridge. So I simply took one out and cut off a slice that was probably a healthy tablespoon and a half, peeled off the peel, and plopped it in the food processor. I added the dill in this recipe because I have some growing in my yard right now, and I love the taste of it with sweet potatoes. The result is an unconventional spread that is a little sweet and a little tangy and a little savory. The sweet potato doesn’t quite overpower the eggplant. Instead it gives it some depth. Do I sound like I’m describing wine? 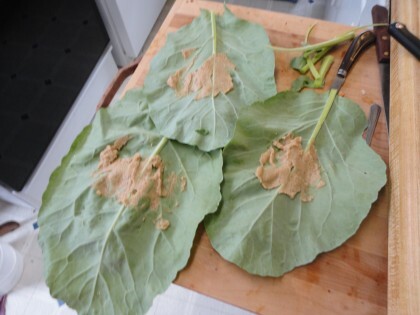 I tend to get rhapsodic about a good spread, because you can do so many things with it besides dipping veggies or pita triangles into it: plop a scoop on top of a salad or a stir-fry, use it as a dressing to massage kale or other leafy greens, make it a layer in a wrap, whether you’re using a big green leaf, or a whole grain tortilla or lavash. So get a little mischievous. Let orange sweet potato or yam but the devil in your Baba Ganoush. Poke the eggplants with a fork and roast them at 425 until they are browned and soft, about 40-45 minutes (depending on size and shape your eggplant they may take more or less time), as Susan directs here. When they have cooled, peel off the skins, and remove seeds if they are dark and firm. Place all ingredients in the food processor and process. Start with smaller amounts and adjust to taste. 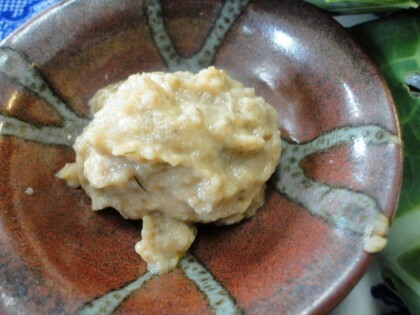 If you want your baba ganoush a little saltier, add salt or a small dab of chickpea miso. Personally the lemon zest gives it enough of a kick for me. If you aren’t yet sufficiently tempted into non-traditional baba ganoush territory, here are some shots of a wrap in progress, with Off-Beat Baba Ganoush as an important player. 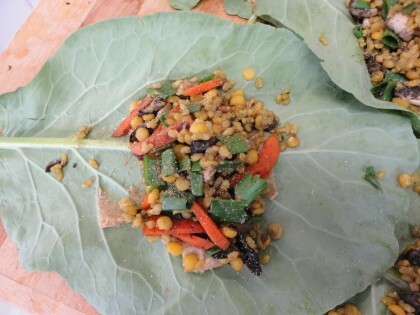 The “wraps” I used here are delicious local collard greens from Affinity Farm. 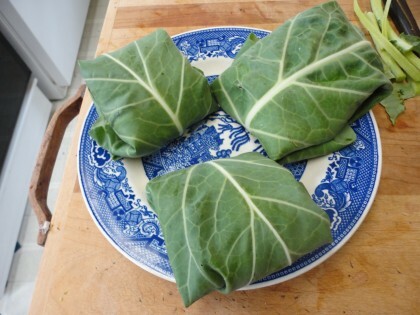 They are so tender that it’s not even necessary to blanch them in order to make a successful wrap. 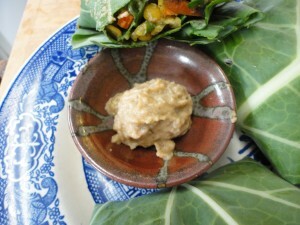 Adding the baba ganoush is easy as spreading peanut butter, only a lot better for me. Then I put some leftover easy pilaf (easy pilaf post coming hopefully in the not too distant future) and other veggies over the Off-Beat Baba Ganoush (which you can still see peaking out from under the pilaf at the left hand bottom of the photo). Ooh, this sounds good! I’ve added sweet potato to hummus (some call it Yammus!) and what a great idea to add it to Baba! I’ll have to try that next time.